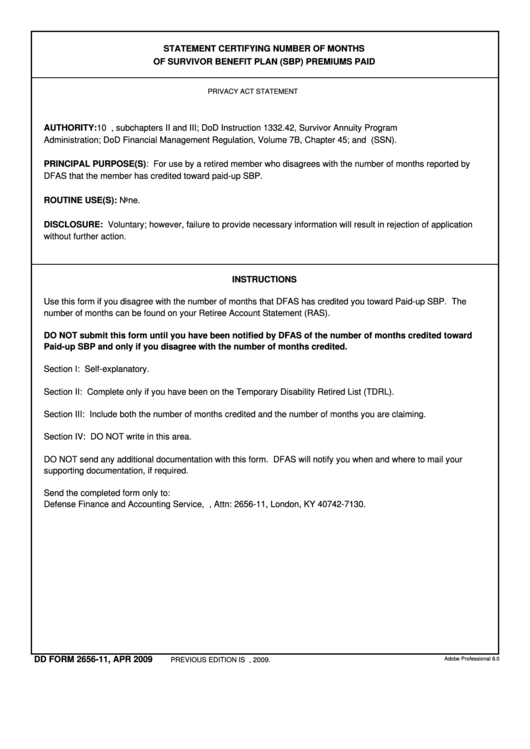 Download a blank fillable Dd Form 2656-11 - Statement Certifying Number Of Months Of Sbp Premiums Paid - April 2009 in PDF format just by clicking the "DOWNLOAD PDF" button. Complete Dd Form 2656-11 - Statement Certifying Number Of Months Of Sbp Premiums Paid - April 2009 with your personal data - all interactive fields are highlighted in places where you should type, access drop-down lists or select multiple-choice options. Administration; DoD Financial Management Regulation, Volume 7B, Chapter 45; and E.O. 9397 (SSN). DFAS that the member has credited toward paid-up SBP. number of months can be found on your Retiree Account Statement (RAS). Paid-up SBP and only if you disagree with the number of months credited. Section II: Complete only if you have been on the Temporary Disability Retired List (TDRL). Section III: Include both the number of months credited and the number of months you are claiming. Section IV: DO NOT write in this area. Defense Finance and Accounting Service, P.O. Box 7190, Attn: 2656-11, London, KY 40742-7130. PREVIOUS EDITION IS OBSOLETE. THIS FORM EXPIRES ON JUNE 30, 2009.